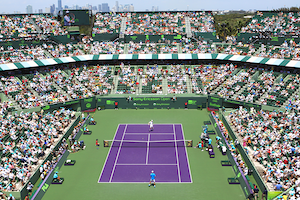 Second round play for the WTA and ATP continue today at the Sony Ericsson Open with many top ten players from both tours on the schedule. The morning starts with last year’s Sony Ericsson Open champion, Victoria Azarenka, on stadium court squaring off against Alexandra Dulgheru. Jelena Jankovic and Caroline Wozniacki, the winner and runner up at Indian Wells, are on the grandstand and court 1 respectively. After her great play in Federation Cup, a rejuvenated Melanie Oudin faces a struggling Vera Zvonareva. This is another chance for the U.S. Open quarterfinalist, Oudin, to claim yet another Russian scalp. In the afternoon, Kim Cljisters works on sealing a third round spot versus Petra Kvitova on stadium court. Novak Djokovic, the 2009 Sony Ericsson finalist, has a date with Oliver Rochus while Rafael Nadal will need to sidestep Taylor Dent to book a third round bid. Americans John Isner and Sam Querrey attempt to reach the third round for the first time in Miami, they will be in session on the outside courts. Charismatic Frenchman Jo-Wilfried Tsonga, a quarterfinalist in 2009, hopes to make short work of Guillermo Garcia-Lopez. Saving the best for last. In the night session, Elena Dementieva will look to avenge her second round Australian Open loss to Justine Henin, as these two face each other for the 13th time. Although Henin has a commending 10-2 record in their head to head, this one will likely have spectators on the edge of their seats. The women will be followed by Andy Roddick and Igor Andreev. 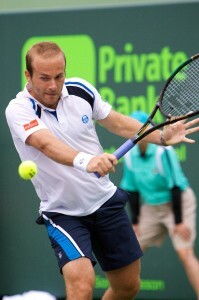 After a tough outing in the finals at Indian Wells, Roddick will try to rebound. With the players tied after four meetings, Roddick may have his hands full.